The Inferno, the perpetual enemy of the light and of the Haven. After nearly 1,000 years of consistent internal conflict and largely failed attempts at conquering the Haven Empire under any name, the demons will endeavour to finally capture Talonguard in 'Queen Isabel's War'. The first great demon incursion. The great wizard Sar-Elam, know as the ‘Seventh Dragon’, sacrifices himself to end the Wars and repel the demon incursion. Sar-Elam and his disciples seal the demons away to prevent their return. A schism (division) occurs within the disciples of Sar-Elam, who can’t agree on the best way to follow the road laid down by the Seventh Dragon. Sar-Antor founds the Blind Brothers, a congregation of healers, seers and embalmers dedicated to the worship of Asha. Sar-Badon founds the Dragon Knights, a martial order disciplined in both body and mind. A total lunar eclipse provokes a massive rupture of the Demon Prison. 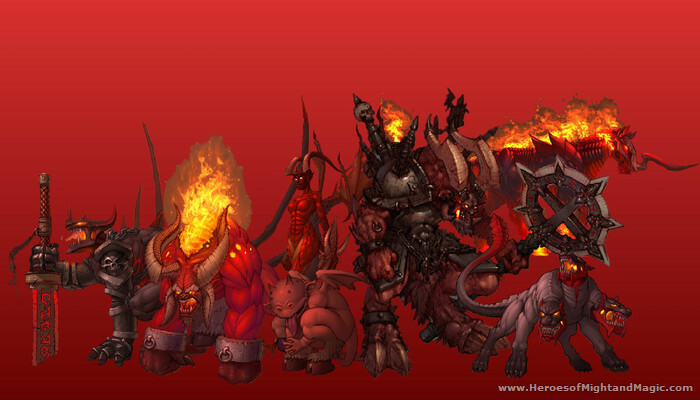 The Demon Lords force their way out and wreak havoc across the lands. Armies rally to meet them, but, caught by surprise, they are rapidly overwhelmed. The Demons are finally defeated but at a most terrible cost. The Demon Lords are cast down, and the surviving demons banished back to their hellish prison. The Dragon Knights emerge from hiding to repair the prison as best they can, then vanish once again. Total lunar eclipse. This time the Blind Brothers had predicted it, and the Alliance, helped by the Dragon Knights, is quick to react. Only a small band of demons manage to escape into the world. The names of the Demon Lords, Urgash’s first children, are heard no more. Instead, the name of Mal-Beleth, the new and only Demon Sovereign, appears. A Total eclipse. This time, the Demons storm the capital of the Falcon Empire and massacre the royal house. As soon as the Demons are repelled, fighting breaks out as the various noble houses attempt to claim the throne. Duke Ivan of Griffin conquers the bloody crown. The Empire is renamed the ‘Holy Griffin Empire’. An eclipse not forecast on any calendar grips the Blind Brothers in a panic. The Demons emerge in force and march towards Haven’s capital. This war will be known as Queen Isabel's War and is the topic of Heroes V’s campaign. Very little is known of the characters at this point. The only elements of the Demon storyline revealed is the above chronology. The Great Wizard Sar-Elam: The Seventh Dragon: The original and most powerful wizard of magic, sacrifices himself to prevent the demon incursion in 40 YSD. Sar-Elam and his disciples banish the demons into a dimensional, hellish prison in the depths of the 'Fiery Mountain' to preclude their return. Sar-Badon: The founder and first leader of the 'Dragon Knights', a martial order disciplined in both body and mind. They later retreat from theworld and focus on upholding the teachings of the 'Seventh Dragon' and watching for any demon activity. Sar-Shazzar: Formulates the 'Prophecy of a Demon Messiah' that states, among other clauses, that a Half-Demon hero will arise, destroy the Demon Prison and engulf the world in a bloody rage. Urgash: The father of the Demon Lords. Mal-Beleth: The only Demon Sovereign.